Archer is a critically acclaimed and award winning animated comedy on FX. As Lead Motion Graphics Designer on the show, I work in collaboration with the Art Director to interpret any and all motion graphics required in each episode, including the title sequence and end credit design. These are revamped each season to match the style and aesthetic of the Archer’s ever changing theme and direction. The re-skin introduced a more pastel palette. The blocks of colour featured new background schematics, their edges take on a more hand cut feel, and a layer of real airbrush added a texture. 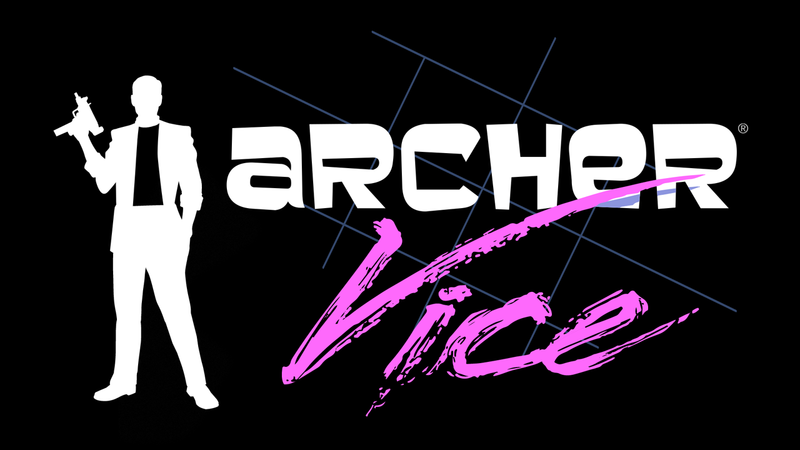 Of course, the highlight of the Vice re-skin was the title card blowing away in a puff of cocaine, an inspired suggestion from Archer Art Director Chad Hurd. I tried to create the cocaine digitally, but it was too synthetic and just didn’t look right. The only way to achieve the look we wanted was to shoot it as a real life practical effect. We got a stencil made, and after some experimentation I settled on double zero pizza flour and an electric air pump from an inflatable bed. Ideally you’d do something that messy outdoors, but Atlanta’s humidity affected the flour. I volunteered to do it in my bathroom at home, with the assistance of Animation Director Bryan Fordney and 3D Director Robert Paraguassu. Thirty takes later I had a thin coating of flour throughout my entire apartment. I’m pretty sure that’s how you get ants. Back in the digital realm, I re-coloured the word “Vice”, which was shot separately, and went to work on making the practical effects integrate with the digital as seamlessly as possible. All the footage was hidden over the top of the digital artwork, retaining its clean lines until the last possible moment when the air blows across and breaks it apart. The story behind the title sequence and it’s changes over the years was featured on Art Of The Title and Uproxx. This behind the scenes video of the shoot was featured on Uproxx along with a write up of the process.